Class: Sophomore Hometown: Manlius, N.Y.
NOTES: Two-year letterwinner... 2015: Appeared in 17 matches, making four starts ... Started four of the final five matches of the season ... Netted the game-winner in win over Heidelberg ... 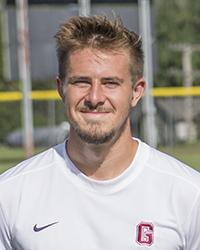 Recorded an assist in win at Waynesburg ... 2014: Appeared in 11 matches, making one start... Made first appearance in season-opener against MVNU... Made first collegiate start against Hilbert... Recorded first assist on lone goal against Carnegie Mellon... Scored first goal as a Wolverine in win over Thiel.